Set sail into a beautifully designed kid's room with the Baby Knightly Wyatt Nightstand. Sophistically designed with a classic white finish, this sturdy wood nightstand includes one spacious drawer. Inspired by the simple lines and the edgy aesthetics of traditional campaign style, the Wyatt is accentuated with aged brass metal plates on all four corners of the nightstand and a matching sunken metal pull drawer handle. Offering both style and functionality, the Wyatt's charming X-base leg design will not only catch your eye but will also provide a sturdy place to keep your bedside items close. 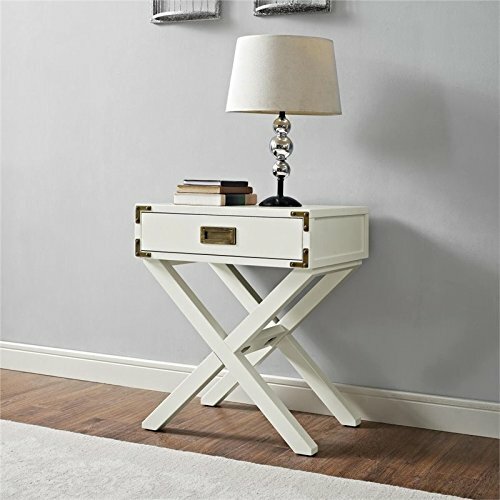 Combine the Wyatt Nightstand with the rest of the Baby Knightly Wyatt Collection and create a soothing space that your child will love for years to come.